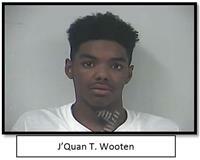 Update: On October 9, 2015, the Sheriff’s Office arrested J’Quan T. Wooten, 19, of Mechanicsville, in connection with a shooting that occurred on September 28, 2015, in the parking lot of Beaverdam Creek Apartments. Wooten has been charged with attempted robbery, aggravated malicious wounding, and use of a firearm in commission of a felony and is currently incarcerated in Pamunkey Regional Jail. Investigators determined that while Wooten was participating in the robbery, he was struck with the same bullet that first injured the 21-year-old victim.